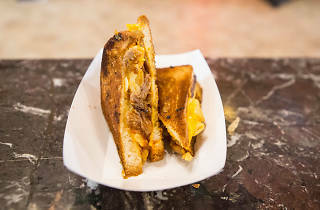 This past Sunday, cheese fanatics across L.A. tested the limits of their stomachs at Time Out L.A.'s very first Grilled Cheese Meltdown, a battle between six local restaurants to see who would win the title of best grilled cheese. The contestants were fierce: the Grilled Cheese Truck, Fred 62, the Carving Board, the Walrus & the Hedgehog, Catcher in the Rye and Richeeze all battled it out at the Majestic Downtown with their unique grilled cheese variations, whooping it up when attendees dropped voting tickets in their respective boxes. Tender Greens dished out bowls of creamy tomato soup to accompany the sandwiches, while Angel City Brewery poured beer to wash it all down. Best Friends Animal Society also joined the event, sharing information about their adoption services. So who won the contest? It was a close call—the closest, in fact, in Time Out Los Angeles event history. 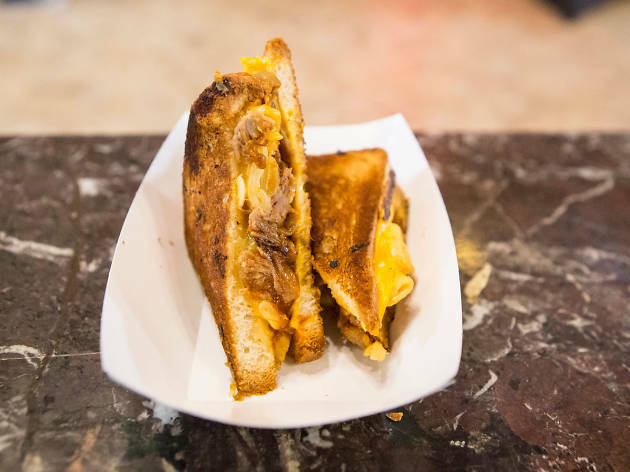 But in the end, The Grilled Cheese Truck scored the most votes for their mac and cheese grilled cheese. Congratulations to them, and to all of our phenomenal vendors! Thank you all that voted for us! It was a tough choice im sure!